Oklahoma City Thunder point guard Russell Westbrook (0) drives past New York Knicks shooting guard Iman Shumpert (21) during the first quarter of a game at Madison Square Garden. When Russell Westbrook’s knee gave out in the first round of the playoffs a season ago, the talk began to diminish. Westbrook was ruled out of the playoffs and the Thunder slogged through a first-round win over Houston. Suddenly, Westbrook seemed more valuable. Then Kevin Durant couldn’t do it all himself in the next round. Durant won one game, but that was it. Memphis topped OKC in five games and not-so-suddenly Westbrook became missed. Then the offseason and then the questions. When could Westbrook return? When could he be in game shape. A setback in the preseason only made the questions seem even more real. Doubters of Westbrook became some sort of combination of silent and dormant. Not much to say after the injury. Not any more. No one "hates on" Russell Westbrook these days, aside from the occasional rogue Twitter rant, yet those who were on Westbrook’s side from the beginning love to taunt and tease, asking regularly after each Westbrook pass, dunk or steal, "Where ya’ll at now?" They just don’t exist. Not unless they’re talking about Westbrook’s wardrobe, because his game is really good these days. "I’m still working at it," Westbrook said to ESPN after his Christmas Day clinic. "Just trying to get back in rhythm." OKC beat up the Knicks on Christmas, 123-94, and Westbrook had 14 points, 13 rebounds and 10 assists in only 29 minutes. He earned his seventh-career triple-double with more than 5 minutes remaining in the third quarter and didn’t play in the fourth. He became just the sixth player since 2005 to earn a triple-double in less than 30 minutes, according to Dailythunder.com. So, please, if you’re one of those calling out people who are no longer listening about Westbrook and his deficiencies, stop. It’s time. "Triple-double in three quarters," Durant said of Westbrook to The Oklahoman after the game. "That speaks for itself." Durant’s right. Westbrook’s game does that. After missing just two games this season, when it was expected he’d be out up until about now, Westbrook hasn’t just come back, he’s come back better. He’s averaging more points (21.6) than his career-average of 20 and averaging more rebounds (5.7 to 4.9) as well. The resurgence of Russell is one of the reasons the Thunder have played better this season than any of their previous. At 23-5, the Thunder are the best of a loaded Western Conference. A six-game road winning streak is the current good news and the future this season looks to be about as positive as can be, thanks to a deeper and more viable bench, the ascension of Serge Ibaka and the well-polished, complete games of Westbrook and Durant. And while the Thunder had a lot of those same pieces a season ago, the absence of Westbrook in the playoffs exacerbated problems that were simmering all season. OKC had Kevin Martin off the bench, but the lack of a third scorer never became a consistent thing. With Westbrook out, that second scorer was gone and the third scorer never showed up. Westbrook playing at a high level makes the Thunder great on face value, but his ability to dominate in numerous phases makes players like Ibaka and Reggie Jackson legit scorers. 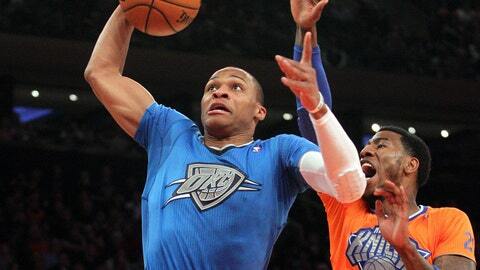 Westbrook makes Jeremy Lamb a weapon and makes Derek Fisher’s knees feel better. More minutes for Westbrook = less pressure on a creaky veteran. And one more thing â Westbrook makes Durant better. The burden of carrying a team on a nightly basis is thankless. If Durant struggles, folks wonder what’s wrong. But if Durant struggles and Westbrook’s there, suddenly the burden is lighter. There are no more Westbrook haters.